South Tyneside celebrates Guy Fawkes Night – first pictures | Curly's Corner Shop, the blog! 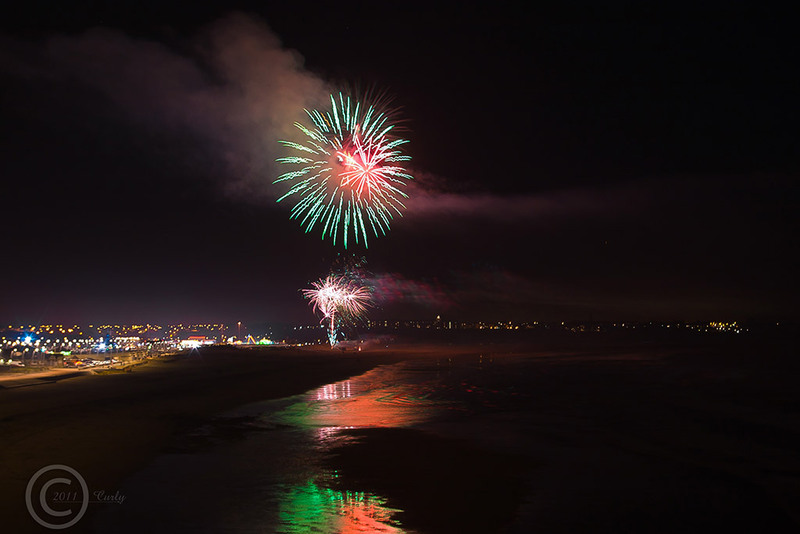 Thousands of South Tyneside residents and visitors made their way down to Sandhaven Beach in South Shields this evening for two spectacular firework displays to mark Guy Fawkes Night. The days when you could organise your own display in the back garden or have a bonfire and a “Guy” have long since been frowned upon and virtually stamped out in a town which used to witness hundreds of fires and thousands of privateer pyrotechnics in the past. 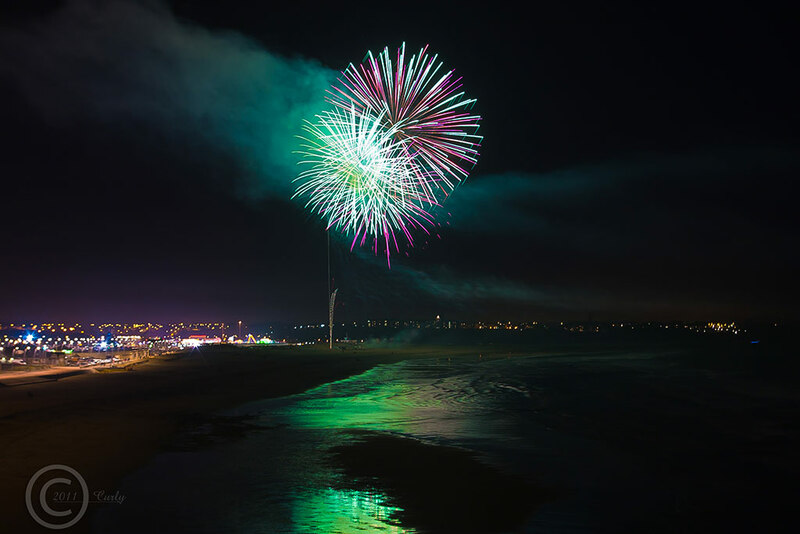 South Tyneside Council in partnership with the Ocean Beach Pleasure Park and others contributed to an enormous display behind the funfair, which stayed open until late offering cut price deals on fairground rides for the family. 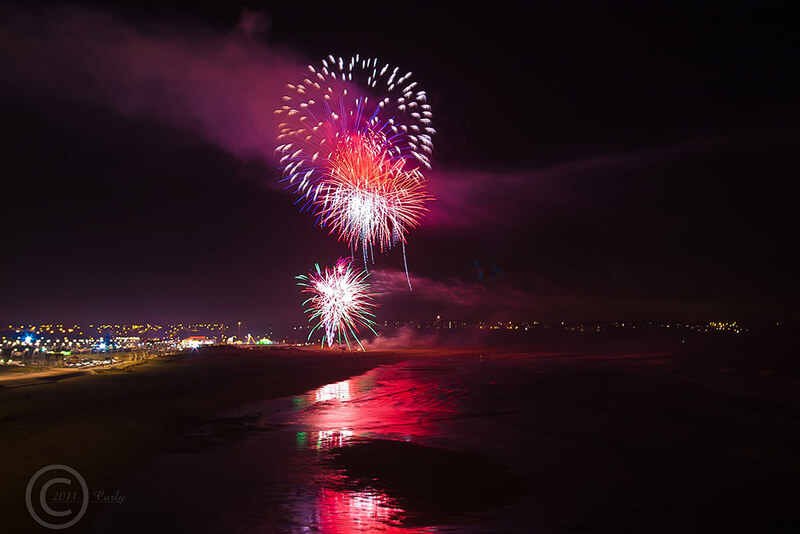 The council also offered concessions on sea front car parking to help families enjoy the occasion knowing that hundreds of children would want to hear and see the show and be home in bed at a reasonable time to be ready for school tomorrow. Last year I suffered a few minor disasters in my attempts to photograph the event, having rushed around in a last minute mad dash to get to my preferred location, I’d set up my tripod on sandy ground having arrived as the first rockets climbed into the sky, I didn’t have time to set up correctly, fired the shutter manually, set the wrong iso speed, and generally messed up big time. Tonight my plans were carefully laid, I knew where I was going to park, knew exactly where I was going to set the tripod, all batteries were fully charged, wireless remote tested and ready to go, I arrived twenty minutes before the show was due to start, Curly and kids were ready to rumble! The night was cold, 4 degrees Celsius, high pressure, not a cloud in the sky, all the stars were out and a big moon shone down on The Leas, but we were well attired and snugly wrapped in big coats. scarves, and hats, we couldn’t possibly go wrong this year. 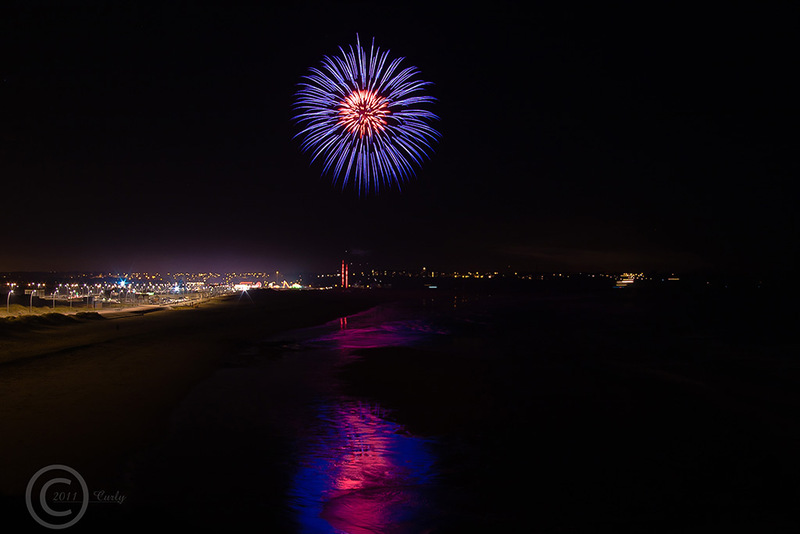 Everything was timed to perfection, torch in hand we climbed the steps up Trow Rocks and the kids marvelled at the sight which panned out below them, lights glinting off the gentle waves and wet sand and from quite a few irresponsible car drivers parked directly on The Leas, oddly the car park was almost empty. We could hear the voice of “Tommy the Trumpeter” aka Ray Spencer rousing the crowds further along the beach getting them ready for the big countdown, launch time was almost upon us. “Missy’s” favourite tunes were drifting in the still air as a modern beat raced ahead of the almost still waters, and then the first glowing lights appeared somewhere behind the fairground, we couldn’t see the crowds but we could certainly hear them. Once the Roman Candles and rockets started to fly into the velvet black night sky, the light, colour, and sounds burst forth across the Tyne, a crescendo and cacophony of explosions ripped through the still air as we watched a splendid show from one of the best positions on offer, without the hassle of being jostled or cramped. I was delighted, the shots were “in the bag”, also glad that my pre-planning had worked a treat, for you photographers who wonder why your shots are never quite as exciting as they might be, or blown out, try my plan – iso 100 or 200, no higher, tripod mounted, 4 seconds at f8, shutter fired by wireless remote to minimise the risk of camera shake. 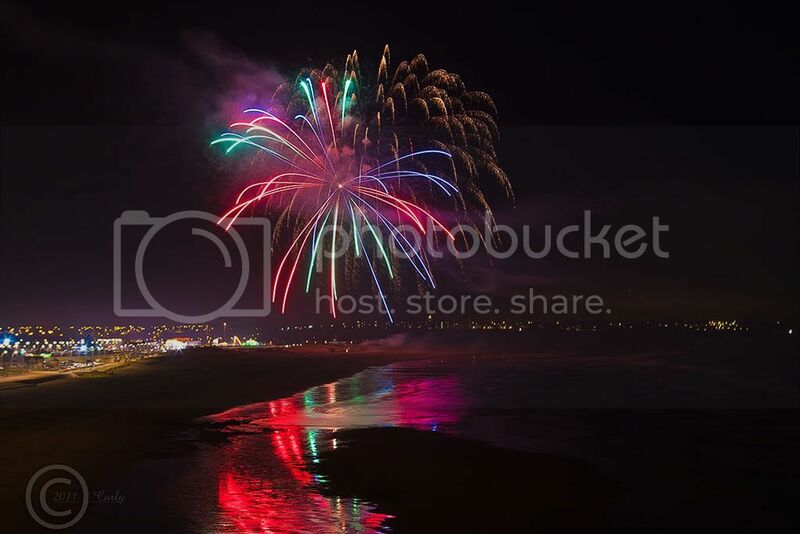 I think I’ve bagged the sharpest set of fireworks pictures since 2010 when South Shields Town Hall celebrated its centenary. In the midst of the gloom and uncertainty of recession, debt reduction, Eurozone currency crisis, and job losses, it is good to come together as a community and remember the “Gunpowder Plot” (although I don’t recall Ray Spencer telling everyone that was the entire reason for this evening’s colourful spectacular). So thanks must go to the team at South Tyneside Council and their various partners for collaborating to provide this opportunity, especially welcomed by children, who at least went home to bed cold but cheered. I repeat what I have suggested in previous years, this event could be hugely enhanced with a giant bonfire (Gateshead uses one in Saltwell Park) and an open invitation to schools to bring “Guys” to burn on it, a tradition lost in the battle with the health and safety police, but I’m sure if carefully organised could make a welcome if restricted return. So please enjoy a few of my pictures taken this evening, they will all open larger when clicked, and if you were a visitor to South Shields this evening, I hope you enjoyed yourselves and plan to return shortly. Good photos, like the reflection in the sea. Not sure what you mean about organising you’re own firework display in the back garden? Has it really been “frowned upon” and “virtually stamped out”? Would be pointless the supermarkets selling them if that was the case, and from what I noticed they were doing a roaring trade…Maybe it’s a different story in your area of Shields? No it’s quite the same, but have you ever gone through the bureaucratic quagmire of trying to “organise” a fireworks show for a few neighbours? Ask the council, you will need a massive third party insurance policy for starters, x amount of safety barriers per twenty people, a fall out area the size of two football pitches, x amount of trained first aiders, fire wardens, and don’t even bother about going into the hygiene regulations for bangers or roast spuds. The whole thing is a nightmare, best to go to the beach! I was that excited with them that I just had to share them Brian. All my past firework photos have been disastrous so I’ve taken note of your settings for some future experimentation of my own. These are far better than anything offered by the Gazette tonight Curly, they are really well done. My neighbours had a small bonfire and firework display which they invited me to. A good way of avoiding complaints!! And of course asking for pennies for the guy. I agree wiith the competition and bonfire idea though.